Activate your kids' imagination with Pinna! The only screen-free, ad-free audio streaming service for kids 3-8. 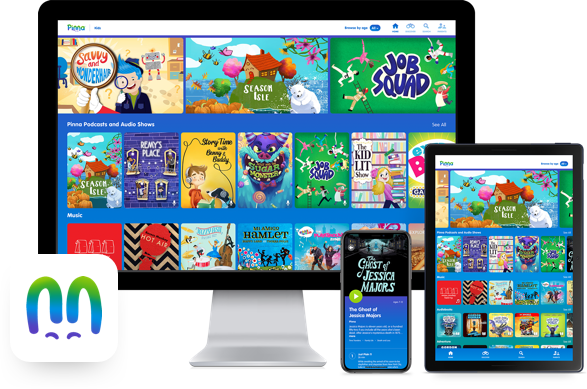 All your kids' favorite podcasts, music and audiobooks including dramas, mysteries, science, game shows, comedies and so much more. Unlock the power of audio on demand. At home or on the road, with friends and family or on their own, Pinna is a screen-free, ad-free way for kids to play and listen. Instantly access hundreds of hours of award-winning podcasts, audio shows, music, audiobooks and more. You won’t be charged until your free trial is over. Cancel anytime. Price shown in USD. 2 months FREE: Pay for 10 months, listen for 12!